We are using this opportunity to extend our warm gratitude to God , to Christ United Methodist Church and all those who made it possible for Dr. Marlegrecy N’Ovec (Mercy) to come and be a blessing to the Nation of Saint Lucia, our YWAM Centre and us as a family. An Encouragement and dynamism that is contagious. From her arrival at the airport in Saint Lucia on August 15th 2018 we realized that Mercy is not a person like everyone. warm and social, she connect with everyone she meets. From extending blessings to a by standing boy to connecting with our 7 year old son Asaph and taking him on a piggyback ride, we realize that this is Mercy in A Mission. We are a pioneering mission base so with a lot of things going on to help people searching to know more about Him and to make Him know. We were a little concern at first not to get her too busy because of the notice on her health record; but she took all of us as well as our visiting volunteers by surprise; helping in the kitchen, doing a bit of landscaping, always inspiring to draw principles from what she does to edify and encourage everyone during group devotions and meetings: from the parasites entangling our pigeon peas crop to the ripe Julie mangos she help us save from the birds on the tree, Mercy's hands on ability was unmatchable. Prayer Station: we prayed with numerous persons in need walking up to us to ask for prayer in the main square in Castries. From parents wanting a good back to school for their kids to young men just wanting to change the direction of their lives to follow Jesus. 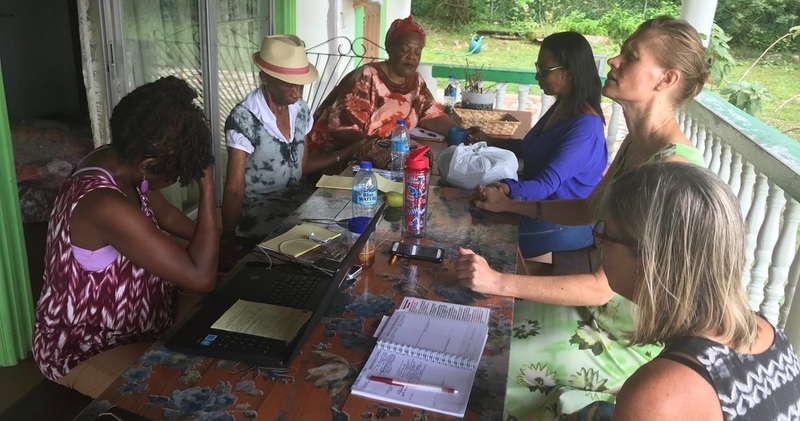 At the moment I completed this update, one of the person we met in Castries came in to collect some of the supplies brought in by Mercy for her six year old .